It is a very small village in Andhra Pradesh but it has an important link to Raghavendra Swamy. It is here that Raghavendra Swamy sat for Chaturmasa and it is also in this place that he consecrated one of the two Anjeneya temples. This is also the village where Teekachar, the great Madhwa scholar and an amsha of Arjuna, and Raghavendra Swamy himself appeared on the idol of Hanuman. This village is almost exactly between Chippargi and Alur in Andhra Pradesh. Its claim to fame is because of the small but beautiful temple of Anjaneya or Mukyaprana. This is Hattibelagall. Hattibelagall is just a short distance from Guntakal and if one wants to visit this village it can be clubbed with a visit to Chippargi which is also near Guntakal and which houses the Samadhi of Vijaya Dasa. 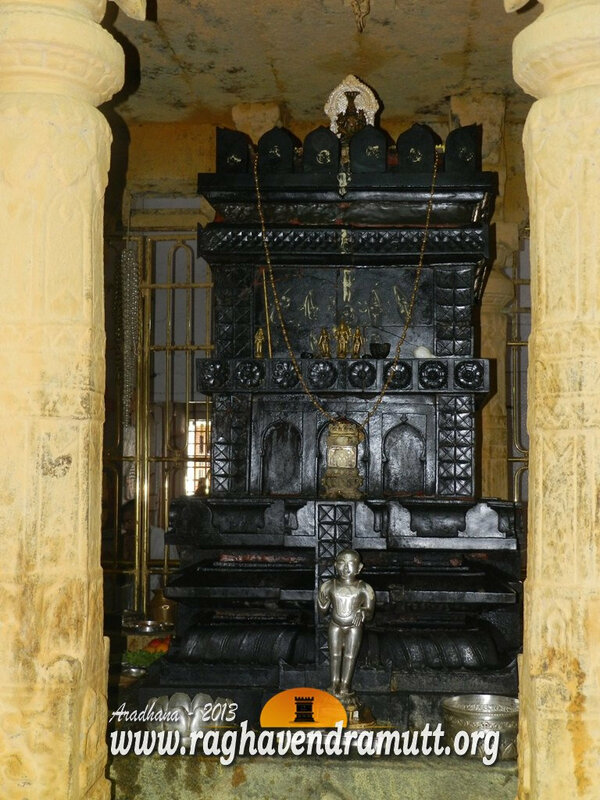 This idol is very unique as it has images of Lakshminarasimha, Teekachar or Jayatheertha and Raghavendra Swamy on its upper side. If you look closely at the Hanuman idol, you can also make out the images of Bilpatrachar, a disciple Aralikatte Narasimhachar and Vadamudidare. The temple is also known as Dewan Venkanna Panta Anjaneya Swamy temple. Dewan Venkanna constructed the large tank which is located adjacent to this temple. The temple is generally open in the morning and towards evening. The temple priest stays in a house near by and you can approach him for details about pooje, seve and even Theertha Prasada. This village is also known for Aralikatti Narasimacharya who is considered to be an amsha-sambhuta of Surya. This saint performed tapas here with his disciples and he was known as an ardent devotee of Raghavendra Swamy. Aralikatti Narasimhacharya was a staunch devotee of Vayu and he had immense faith in Teekacharya. He read Nyaya Sudha several times and was extremely fond of it. Teekacharya appreciated Narasimhachar’s devotion and appeared near the shoulder of Hanuman idol here. Lakshmi Narasimha has appeared near the forehead of Hanuman. Villagers recollect a story of how an aged saint went into the temple never to come back. When this was brought to the notice of Narasimhachar, he said the saint was none other than Raghavendra Swamy. Raghavendra Swamy has identified himself on the idol of Hanuman near the tail. Narasimhachar is also the Adhyatma guru of Raghuprema Teertha of Akshoba Matha. There is a small Brindavana here indicating the place where Aralikatte Narasimhacharya and his favourite disciple Bilvapathrachar left the mortal body. Hattibelagall is approachable either by road or train. You can come to the village either through Bellary or via Alur and Guntakal. There is a train upto Guntakal from where you can hire an auto or a mini bus to the village. It is on the Adoni-Bellary road. If you are motoring in your own transport, come upto Adoni and take the road to Alur. Once you reach Alur, take a left and Hattibelagall is just 4 kms away. You can go to Chippargi after completing pooje at Hattibelagall. If you have time take in Kasapuram where there is a Vyasa Prathistha Hanuman temple.